The record number of military veterans running for office this fall includes many Democratic women. LEXINGTON, Ky. — Retired Lieutenant Colonel Amy McGrath was just 12 years old when she set out to help change the law to allow women to fly fighter jets in combat. Now, she’s on a new mission — trying to take what she learned in the Marine Corps to a divided Washington. 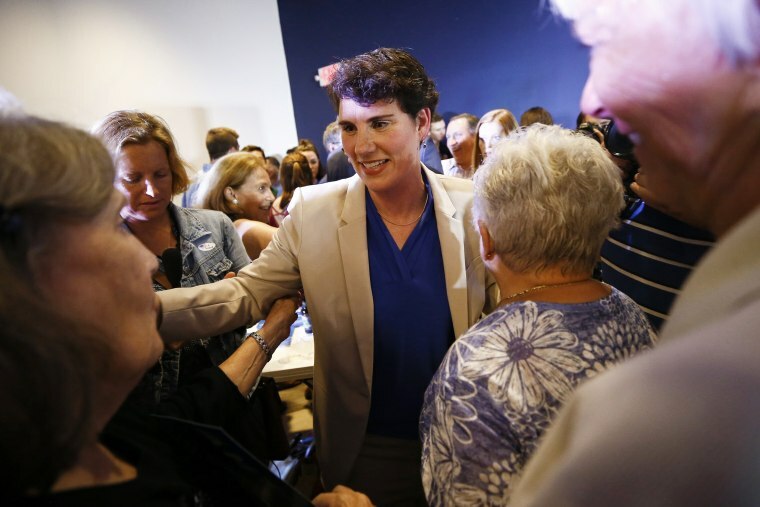 "I think we badly need people in Congress that once they get there ... want to do what's best for the country, want to do what's best for their district, and not necessarily what is best for their political party," McGrath said. The Kentucky Democrat — and first women to fly an F-18 in combat for the Marines — is part of a new wave of military veterans running for Congress this fall, with more than two hundred seeking office according to the non-partisan super PAC With Honor. With Honor is backing 33 of these veterans — 19 Democrats and 14 Republicans — with a mission of helping "elect principled next-generation veterans to office who will work in a cross-partisan way to create a more effective and less polarized government." Amazon founder and owner of the Washington Post, Jeff Bezos, and his wife recently donated $10 million dollars to the super PAC’s efforts. McGrath, who was given the call sign “Krusty” by her fellow aviators because her hair looked a little like the Simpsons character Krusty the Clown, says she is watching too many elected officials today put their political parties above doing what is best for the country — something that runs counter to her training in the military. "You know when I was a Marine and we went out on a mission I didn't look to the marine on my left or the Marine on my right and say ‘hey are you a Democrat, are you a Republican?’ We didn't do that, we said what's the mission," McGrath said in an interview. While she finds herself in a tough race in Kentucky's Sixth Congressional District. McGrath added, "we may not have agreed on lots of things but at the end of the day we put all of our disagreements aside and we said, 'what's the mission?' We got to get it done." There has been a steady decline over recent decades in the number of lawmakers that have served in the military. Back in the early 1970s, nearly two thirds of all members of Congress were veterans. Today, that number is down to just 18.8 percent. It is a statistic that concerns former Navy SEAL Dan Crenshaw, who is running for the House as a Republican in Texas' Second Congressional District. "You know I might look to a veteran on the other side of the aisle and say at least I know you started off loving this country and before you got into politics you started off serving this country," Crenshaw said. "I think that's what we bring to the table, that ability to problem-solve together, that kind of mutual trust I think we have in other veterans and I think that's a great thing for Congress right now." Crenshaw served two deployments in Iraq and then a third in Afghanistan. It was about seven months into his third deployment that his interpreter stepped on an IED right in front of him causing the Lieutenant Commander to be blinded immediately. "I never really wanted to leave public service so I had to find a new way to serve and make that impact," Crenshaw, now medically retired, said. McGrath and Crenshaw are just two of a slew of post-9/11 veterans fighting to get to Washington this fall. And many are also Democratic women, including former Navy Pilot Mikie Sherill in New Jersey. And in Texas, former Air Force intelligence officer Gina Ortiz Jones and former Air Force pilot MJ Hegar, are running as Democrats. At a time when the country is more divided than ever, these veteran candidates believe they might be able to help find some common ground. "(Service members) may not have agreed on lots of things but at the end of the day we put all of our disagreements aside and we said what's the mission. We got to get it done,” McGrath recounted, adding “that's what I think veterans bring to this realm today. This is really why it's so important we have a lot more veterans step up."